You knew what your group wanted to work on - find out how they have been doing so far, with a quick scaling activity. Ask everyone to scale between 10 and 1 where they are now between realisation of their hopes and their fears. You can do this on paper, or - better - walking the scale in the room, to generate more energy. Something comes up in the moment, but you (and probably most of the group) don’t want to devote much time to it for now. Write it on a ‘car park’ chart, visible to all, expressly there to list topics that we can’t or won’t deal with further in this session, but which will be allocated a time and a process for later. Invite participants each to write a letter to themselves. Then post them out a couple of weeks or a month later as a great reminder of the learning, visions or actions from your session. At last! it’s what they call your ‘HBR Moment’. That’s when your big idea gets recognised in an article in the Harvard Business Review. In this case it’s the cover story. 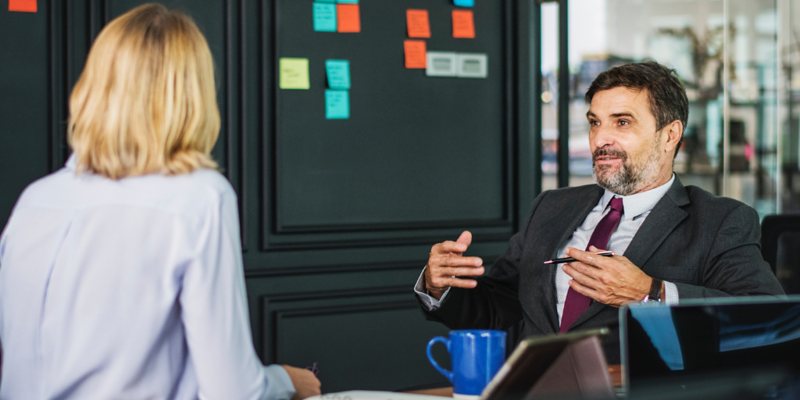 The big idea is that Performance Review Conversations need reforming, because for the most part they are counter-productive and based on faulty, traditional thinking. Co-author is Marcus Buckingham, who we exchanged ideas with a few years ago at a conference in Florida. Since then, we’ve always included him in our presentations, with his ‘Strengths' work as a significant feature in our landscape of positive change. It’s less likely he’s been mentioning us, but you never know. 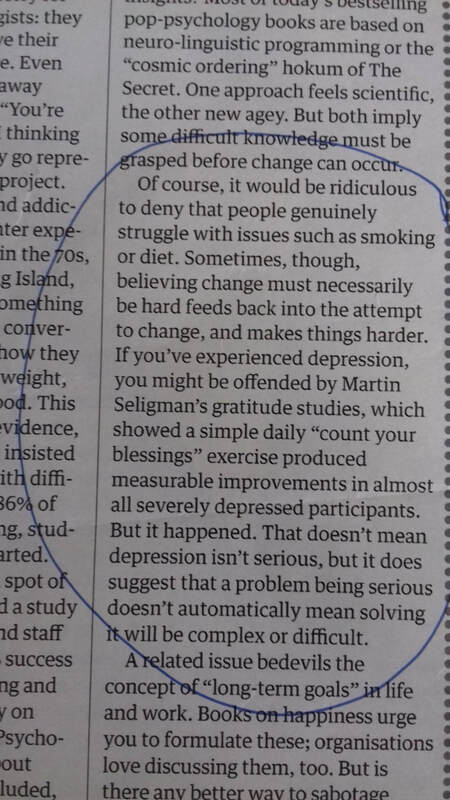 We chatted to Martin Seligman, too, and maintain friendly relations with Positive Psychology. Meanwhile, we’ve been quietly developing and implementing better performance review processes with clients from care homes to dock facilities managers. As the HBR article says, it’s a hot topic, which we’re currently discussing with a leading heritage organisation and a charity for the homeless. You can, as Bruce Springsteen noted, 'spend your life waiting for a moment that just don’t come'. Well let’s not waste any more time on performance reviews that confuse or demotivate. 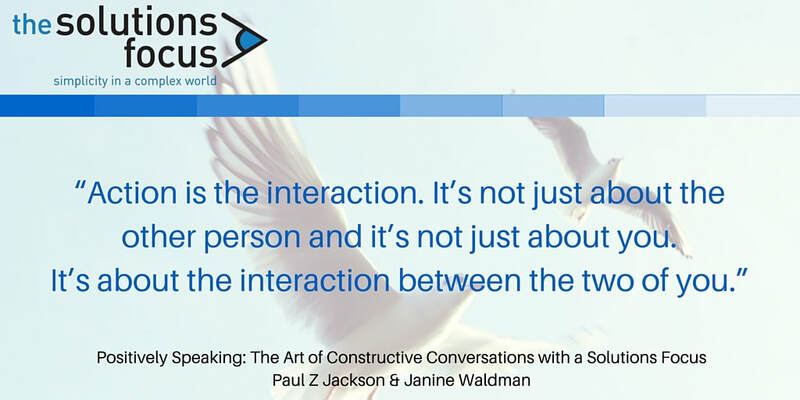 Give us a call to seize this HBR Moment and transform your organisation’s most important conversations! Professional coaches spend weeks and even years attending training courses, honing their skills and pursuing recognised accreditation. All of which can be useful and perhaps essential to be a proficient, credible and skilful coach. But what about professional trainers, who deliver content? They don’t want a career as a coach, but know that coaching techniques will enhance the impact of their interventions. Global mobility specialists BGRS have a pool of highly-skilled intercultural trainers. They provide training on cultural norms and practices for managers relocating to a new country. Whilst trainees are strangers to their new cultures, they also bring with them a wealth of know-how that could be put to work. BGRS wanted their intercultural trainers to develop coaching skills, so as to harness trainees’ know-how. How to help these skilled trainers to be confident and effective at incorporating coaching into training interventions without having to attend lengthy training programmes themselves. Solutions Focused Micro-Coaching Tools (MCT’s) - a set of sequenced solutions-focused coaching questions related to a specific topic. BGRS trainers use these question sets to guide trainees to make significant progress faster. 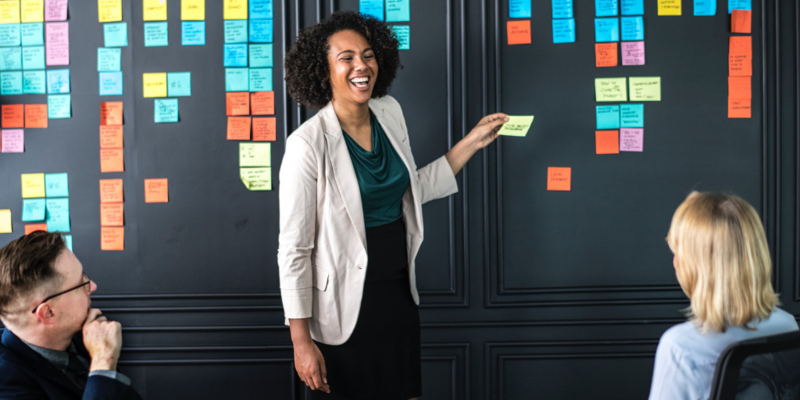 Our colleague Regina Reinhardt, herself an experienced solutions focused practitioner and intercultural coach, identified the topics that relocating managers most frequently raised in training sessions which lent themselves to coaching. ​What are you aiming to achieve through your communications? Which style is most appropriate here (direct/non-direct)? What would be the benefits to you of adapting your style? On a scale of 1-10 where 10 is expert and 1 is you know nothing, how skilled are you already communicating in a non-direct/direct way? What else do you know about this communication style? What would be the first signs to your colleagues/boss/others that you were communicating more in a non-direct/direct way? Where else in your work and/or life would it be useful for you to adapt your communication style? What’s the first thing you can do to take this forward? We compiled a short MCT handbook to help trainers be aware of the tools and to know when and how to use them. We've introduced them with 1 hour large-scale interactive webinars and smaller practice groups, and voila - BGRS now have a bunch of trainers who have started their coaching journey. All equipped with the confidence and tools to switch between training and coaching modes. ​Please feel free to test this coaching conversation structure, and let us know how you get on. Share with us how you encourage trainers to take a more coach-like approach. Nice to see the number one story in the Observer this week was ‘Viruses save a man from antibiotic-resistant bacteria’, in which a 69-year-od American is brought out of a coma and has his life saved by an injected cocktail of bacteriophages. Each phage will attack only one virus, so you have to find the right one to be effective. The trouble with the broad brush approach of antibiotics is that certain viruses become immune to their effects. That’s rather like different approaches to organisational problems. Broad-spectrum approaches can be applied, often with good effect - but not always. We recommend taking care to find the solution that works uniquely for you. 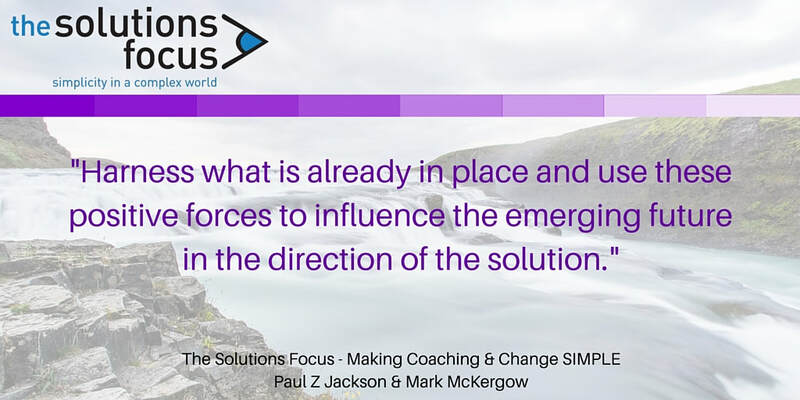 Read more in The Solutions Focus, Making Coaching and Change SIMPLE, by Paul Z Jackson and Mark McKergow. And you can find the Guardian article here. ​At the UKASFP conference, Dr Wendel Ray from the University of Louisiana at Monroe, reminded us about Don Jackson, one of the founding fathers of what’s become the solutions-focused approach to change. Jackson took a view of people not as isolated individuals to be thought about or studied separately, but as part of the small or larger groups to which they belonged. Then any particular individual’s behaviour is seen as them adapting as well as they can to the way the group is operating.